Beverly Hills Jewelers has been located in Beverly Hills since 1979. We serve many Hollywood celebrities. We have thousands of diamonds for you to choose from. Our motto is "Bigger For Less!" You do not need to spend a fortune to have a big beautiful diamond. We specialize in diamond engagement rings and diamond studs. We also have amazing diamond wedding bands and other beautiful diamond bridal jewelry. We have a wide variety of diamond shapes ranging from pear shape, emerald cut, princess cut, ascher cut, round brilliant cut diamonds, and much more! We also have a large collection of colored diamonds. Many brides like to have a fancy yellow diamonds. These are vibrant and beautiful diamonds. Whatever your diamond wishes, we are going to make them come true! Picking the right diamond is a process. But is should not be a stressful process. We can make it a very fun process for you. We will educate you on diamonds before we sell them to you. We have diamond specialist on hand to help you pick out the perfect diamond for you. We also have amazing diamond engagement rings to set your diamond in. 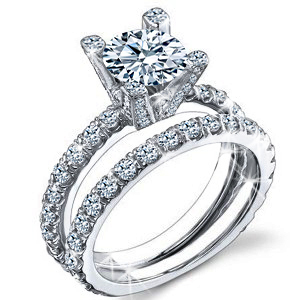 We have popular settings like halo, pave, micro pave, solitaire, and much more. When choosing a diamond the 4 c’s are very important. The four c’s are color, clarity, cut, and carat. You should not have to compromise any of these. We will sell you exactly what it is that you are looking for at an amazing price! We guarantee some of the lowest prices. The most popular diamond shapes for the modern bride are round or princess cut diamonds. The cushion cut diamond has become popular in recent days too. What is great about is that it is between both round and square. It is also more affordable than an emerald cut or asscher cut diamond. Every woman has her own unique taste. All diamonds are beautiful in their own way. Whatever diamond you choose to go with, we will help you get it at the lowest cost. Remember, our motto is "Bigger For Less!"